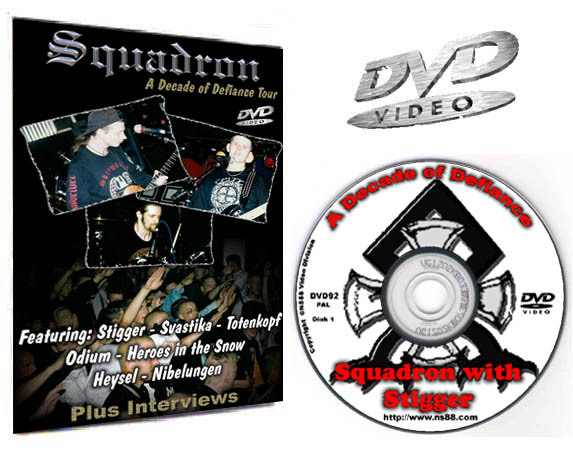 DVD49 - Squadron Decade Of Defiance Tour With Stigger - €15.00 : Buy Now! This DVD contains Squadron touring different locations in Sweden along with Stigger. Ballads performed by Jimmy of Squadron and Stigger. 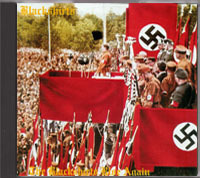 Included performances also from Svastika, TotenKopf, Odium, Heroes in the Snow, Heysel & Nibelungen. *Interview with Squadron conducted by Stigger. *Interview with Stigger conducted by Jimmy of Squadron. 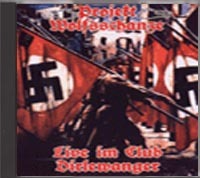 Watch as Stigger tells his experiences with Skrewdriver and Ian Stuart. Filmed in Club Valhalla Sweden by NS88. Runtime: 4 Hours - Color.